The offset figure-eight has the mode of failure shown in the second figure. This behavior is known as inversion, capsizing, or flipping. 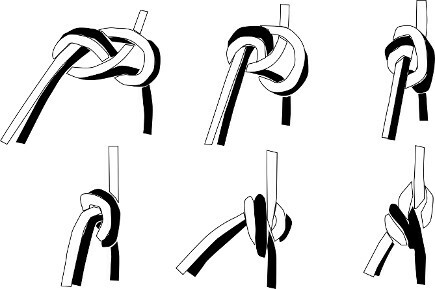 When it happens, the tails of the knot are shortened, and if it happens repeatedly the tails can be used up completely, so that the knot comes undone. There is an elegant theory of friction hitches[Bayman 1977], but the offset figure-eight's mode of failure seems to have less to do with forces that overcome friction than with its topology. It has two lobes, and when it inverts itself, one lobe swallows the other. 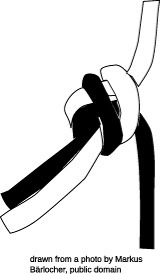 Question: Is there any nice topological way of characterizing what is happening when a knot inverts itself, or any nice way of describing why one knot would be more prone to inversion than another? Browse other questions tagged gt.geometric-topology knot-theory or ask your own question.